« Less Cowbell, More Viola! 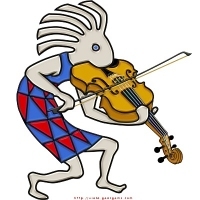 Here’s a curious and charming take on the little Native American deity Kokopelli… with his traditional flute replaced by a viola (big surprise, eh?) First created for a violist who was a real Kokopeli lover, we made this design available in 2005 and it has been well received! An upbeat, stylish look for Violists and viola lovers of any age! Purchase the cute “Kokovioli” design now, exclusively from Bratsche’s Viola Bazaar on various apparel and giftware items for your favorite violist!